(NASHVILLE, Tenn.) March 28, 2019 — With nearly one half of its workforce either active or former military, Nashville marketing agency iostudio advanced its commitment to members of the U.S. military by renewing its agreement with the Employer Support of the Guard and Reserve (ESGR). ESGR, a Department of Defense agency, develops and promotes a culture of support for military employees. iostudio is a multi-year signee to the ESGR agreement, and a 2012 recipient of the Secretary of Defense ESGR Freedom Award, the U.S. Government’s highest recognition of employers supportive of employees who serve in the Guard and Reserve. The ESGR Statement of Support formalizes many commitments, including a pledge to protect military employees from discrimination or dismissal resulting from deployment, as established by the Uniformed Services Employment and Reemployment Rights Act. The company also pledges to encourage opportunities to hire Guard members, Reservists, and Veterans, and continually recognize and support our country’s service members and their families, in peace, in crises, and in war. Lisa Menck-Shock, president of iostudio, signs the company’s commitment with Employer Support of The Guard and Reserve (ESGR), the Department of Defense program that builds support for active duty military by protecting their jobs and employment rights. She is flanked closely by John Dyess, ESGR’s Tennessee Outreach Director, and managers of iostudio’s Navy Call Center operations. iostudio’s support of military employees goes “above and beyond” to include full or differential “gap” pay for numerous types of military leave (duty). Deployed service men and women can earn significantly less than their civilian positions pay during deployment; iostudio makes up the difference during those months so no employee’s service hurts them financially. The Nashville-based company also provides any benefits for which it is lawfully able during employee military leave, and allows for military employees to use PTO prior to active duty or following release from active duty beyond what’s required by law. iostudio’s 20 years of strategy development, content marketing and platform development has included vast experience with military clients, including the U.S. Army, Marine Corps Forces Special Operations Command and the U.S. Navy. The company’s digital and integrated brand solutions also serve national clients in healthcare, financial services, recruiting and retention, government services, and national defense. The first ESGR Statement of Support was signed on December 13, 1972 in the Office of the Secretary of Defense by the Chairman of the Board of General Motors. President Nixon was the first President to sign a Statement of Support, and in 2005 every federal Cabinet Secretary and all federal agencies signed a Statement of Support to signify their continuing efforts to be model employers. ESGR informs and educates service members and their civilian employers regarding their rights and responsibilities under the Uniformed Services Employment and Reemployment Rights Act (USERRA). Statutory authority for USERRA resides with the Department of Labor, and ESGR serves as a neutral, free resource to employers and service members. Information on the many resources is available at www.ESGR.mil. iostudio is a Nashville-based strategic branding company specializing in business optimization, website development, audience lifecycle management, functional content marketing and insights/analytics for some of the strongest brands in America. The company provides innovative marketing and business solutions for companies driving positive change. Its core business principles, client list and portfolio can be viewed at www.iostudio.com. This month, the Field Guide to Functional Content Marketing made noise publicly as the American Advertising Federation named it one of the top content marketing projects in the region, which includes Alabama, Georgia, Louisiana, Mississippi and Tennessee. The project will be recognized April 12 in Mobile, Alabama, at the AAF District 7 Spring Convention. 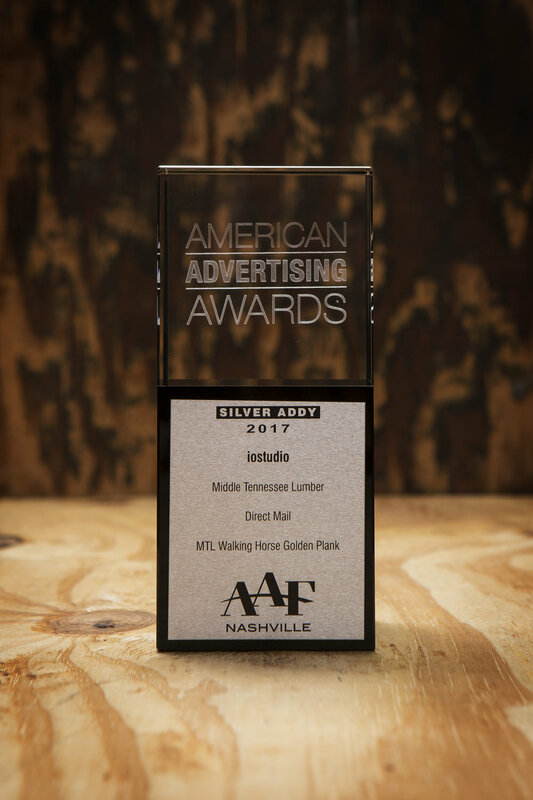 As a regional Gold Addy winner, the Field Guide advances to the American Advertising Federation’s national competition to compete against entries from 15 districts. Approximately 40,000 entries are judged nationwide each year, and the final round takes place between April 25 and 27, 2019. The pocket-size 32-page booklet is divided into 13 sections, each with an observation about content marketing and a tactic for practical use in developing a market strategy. It draws on iostudio’s nearly 20 years of strategy development and content marketing for branded publications, digital experiences and integrated brand campaigns serving national clients in healthcare, financial services, recruiting and retention, government services, and national defense. In fact, the agency’s vast experience with military clients, including the U.S. Army, Marine Corps Forces Special Operations Command and the U.S. Navy, influenced the format of the booklet and its compact format, which mimics a military-issued field guide. Each content marketing tactic is illustrated with sketches inspired by two-time Pulitzer Prize-winning editorial cartoonist Bill Mauldin, who earned fame with his empathetic wartime characterizations of soldiers enduring the difficulties of duty in the field. A downloadable version of the Field Guide to Functional Content Marketing is available at iostudio.com; users can also request to receive a free print version through the mail. Want to know more about the guide? Kawasaki shared a greater perspective about functional content marketing and the origins of the Field Guide in the Spring 2018 issue of Content Magazine. Guide for content marketers wins gold. 2019 American Advertising Federation regional competition. Nashville, TN, November 1, 2018 — iostudio will continue as front-line support to the YouCanQuit2 tobacco cessation initiative from the Department of Defense (DoD), following a contract extension through October 2019. The YouCanQuit2 program mission is to help U.S. service members and their loved ones quit tobacco by allowing them to access free information about cessation techniques, workplans for quitting, and round the clock online Live Chat support. It is through that online Live Chat assignment that iostudio advises on the resources and coaching connections available to the DoD community to help quit their use of tobacco. “This is why we go to work each day at iostudio; to pool our talents and experiences into services that directly help people — in this case, the inspiring service members and civilians affiliated with the Department of Defense,” said Keith Kawasaki, Vice President of Client Services and Contract Management at iostudio. The Department of Defense (DoD) dedicates a website to the program at www.tricare.mil/ucanquit2. Tobacco use can lead to heart and lung disease, as well as cancer. Research shows it can increase chances for hospitalizations, missed workdays, failed fitness evaluations and impaired night vision. Because quitting can take several attempts, iostudio’s contact center operators provide support through several stages of tobacco addiction and cessation, and have been trained to adequately advise beneficiaries in recommended appropriate cessation techniques, treatments and resources. In 2017, iostudio was awarded a subcontract from Pathways 2 Solutions, a CVE-Verified Service Disabled Veteran Owned Small Business, under contract with Booz Allen Hamilton as part of the Department of Defense (OSD-P&R) Counter-Marketing Programs for Tobacco Cessation. 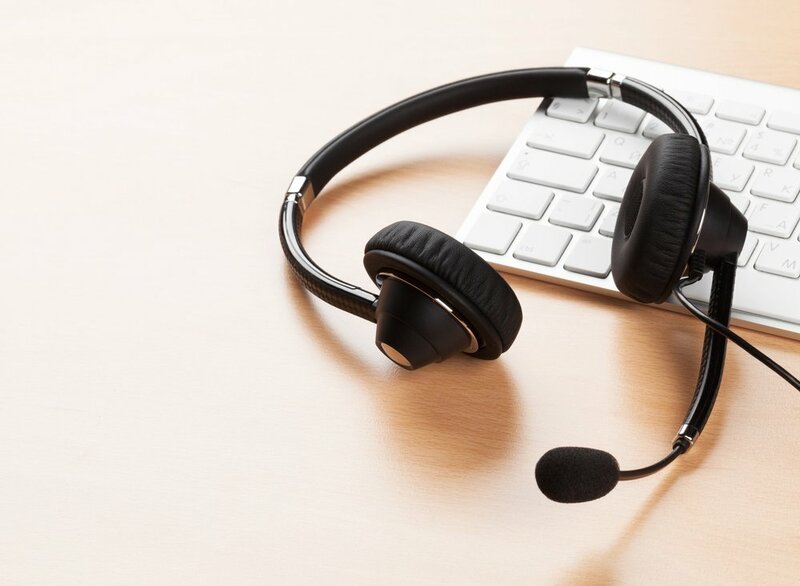 Based on iostudio’s excellence in contact center capabilities, Pathways 2 Solutions renewed iostudio’s subcontract to provide chat services to answer questions and provide coaching, education and resources for DoD community members. Nashville, TN, Oct. 17, 2018 — iostudio hasbeen awarded a year-long subcontractto provide a series of videos and photographs in support of the USDA Forest Service’s diversity and inclusion programs. The United States Forest Service protects and manages 154 national forests and 20 grasslands in 43 states and Puerto Rico to meet the needs of present and future generations. Consisting of over 40,000 employees depending on the season, the Agency has initiated ongoing communications and awareness campaigns focusing on issues of diversity and inclusion. The work, through the Office of Civil Rights and Human Resources Management, seeks to elevate awareness of accommodations they are making for individuals with disabilities. Pathways 2 Solutions chose iostudio as their partner on the filming, production, and post-production work. The team earned the work by showing a clear understanding of the Forest Service’s mission, as well as showcasing extensive experience with the delivery of impactful videography and photography packages. Among the many assets of the U.S. Forest Service. “As an agency, we focus on clients who advance positive impacts on the world around us, and we enthusiastically welcome this opportunity to enhance the U.S. Forest Service’s assets,” said Jen Mears, Proposal Manager at iostudio. iostudio’s diverse portfolio includes work that benefits commercial health care and financial services clients, Federal wildlife conservation agencies, the U.S. military branches, state government agencies, and more. The team’s initial scope of work for the project included creative direction, project management, videography and photography production, and post-production. Following the initial project kick-off meeting, the team’s demonstrated enthusiasm and professional expertise prompted the Forest Service to exercise all of the project’s optional contract line item numbers. NASHVILLE, TN, July 27, 2018 — iostudio has named Robert Weaver, Army Sergeant First Class, retired, as the Company’s Department of Defense-Certified Facility Security Officer (FSO). Strengthening iostudio’s two decades of service to Federal government clients, Weaver’s FSO certification helps ensure the Company is compliant in process driven facilities security measures. Weaver took over the position from Brad Pray, who received mobilization orders for military service with the National Guard. To obtain his certification, Weaver applied more than 50 hours to highly specialized training through the Center for Development of Security Excellence (CDSE). Facility Security Officer is an additional duty for Weaver. As the Director of Customer Engagement, Weaver is responsible for iostudio’s contact center services, which currently provide program management, software engineering and staffing for the United States Navy, the United States Army National Guard and the Department of Defense. Prior to iostudio, Weaver served 27 years in the United States Army and Army National Guard. NASHVILLE, Tenn., January 1, 2018 — Marketing agency executive and commissioned military officer Lisa Menck-Shock was named President of iostudio today, launching a new era for the $10 million, digital marketing agency. Menck-Shock, a Major in the Indiana Army National Guard, has been instrumental in growing iostudio’s client portfolio and managing internal operations through almost a decade. In her role as agency President, Menck-Shock will direct day-to-day operations while innovating next level strategies for the Company’s culture, growth and profitability. Menck-Shock began her iostudio career in 2006 as a part-time Hero on Call operator, hosting online chats with individuals interested in joining the Army National Guard. Shortly, she was helping to facilitate the National Guard’s move to online enlistment, and eventually worked her way into managing the Guard’s recruiting website (NationalGuard.com), the National Guard social media program, a 24-hour customer support call center and all back-end application development. Almost a decade later, with proven success and experience providing marketing strategies and client solutions on both the agency and client side, Menck-Shock continues to focus on the growth of iostudio. Her strong history of securing and managing multi-million dollar accounts, Menck-Shock assumes operational leadership of the 85-person agency from Powers, who founded the company in 2001. In addition to her executive agency role, Menck-Shock has experience as an Emergency Medical Technician (EMT) and Ophthalmology technician in both the military and civilian sector. She is trained and experienced in medical logistics, planning, operations and patient care and has served an administrative role as Commander for a unit providing state-wide medical support. iostudio is an award-winning marketing agency based in Nashville, Tennessee, that specializes in content marketing, platform development and audience engagement. Our mission is to create meaningful, authentic experiences that empower and enrich people’s lives—while showing measurable results for our clients. We integrate and execute video production, editorial and design, digital development, and social media solutions, as well as end-to-end contact center support. Along the way, we ensure each solution is backed by a data strategy to ensure quantifiable return on investment. Our own Keith Kawasaki, VP of Client Services and Contract Management, is featured this week in Content Magazine from the Content Council. Last week, one of our iostudio VP’s had a little adventure: he participated in the Navy’s Commander Naval Air Forces Distinguished Visitor Program aboard the USS Nimitz! This ship has been in service since 1976, and is the Navy’s oldest (and finest!) aircraft carrier. It accommodates over 5000 crew and has been a part of missions in the oceans around the world. Read more about the USS Nimitz. The primary purpose of the DV Embark Program is to “[place] key leaders from all sectors of society — corporate, civic, government, education, non-profit and service — aboard a deployed carrier. While aboard, embarkees meet the talented young men and women who bring these ships to life, and they experience first-hand how the Navy is contributing to the security of the United States, and to the stability of the global community.” You can read more about the DV Embark program on the Navy’s website. We are so pleased that someone on our team was able to take part in such an extraordinary experience and to bring back the insights he gained to share with us. Check out some more shots of the trip below! iostudio takes home the Gold at the 2017 ADDYs! We're pleased to report that iostudio took home one Gold and five Silver awards at this year's ADDYs! Congrats to the team for all of your hard work! iostudio always kicks off the holiday season each year with a company-wide holiday party, preceded by something we like to call The Santa Store—and who doesn't love a little company swag? The knit caps were a big hit this year! A good time was had by all: we're glad so many were able to be with us for lunch at The Palm! November 2016 Awards Recap: Nine New Awards for iostudio! iostudio took home nine awards for GX®: the Guard Experience Magazine in November. Check out the winning work below! Congratulations to the GX team! GX was recognized for its spectacular long-form writing and story telling with a Gold award. Articles like this one are the reason GX stands out. We couldn't be more pleased to learn that illustrated covers like this one set GX apart from the pack and set the standard for magazine cover design in the industry. We love creating illustrated covers when the content dictates and we're happy that our passion for this was recognized! In some magazines, tables of contents are impossible to find and, when you find them, they're nothing special. At iostudio, we think a lot about user experience in all we do. This informs our opinion on the GX Table of Contents: it's not just for way-finding, it's a destination, too! With all that thinking we do about the table of contents as a story unto itself, we're pleased to recognized in this category as well. We have endeavored to refine the style and presentation of GX Magazine's table of contents since day one. What we've developed is a layout that presents the substantive articles from the issues (the same ones teased on the cover) in big bold photographs and numbering so that they are easy to find, followed by the predictable cadence of the other sections and stories that make up our "Departments." The result is something solid, modern, and familiar. We have a lot of fun with features like this one for "The Evolution of the Rifle," which combines some of our favorite things: product photography, informational graphics, and historical research. Related to this award for Best Single Feature, we also received an Honorable Mention for Best Feature Design, custom publication, six or more issues. As we've stated before, we think the GX Editorial team is pretty spectacular. It's an honor to be counted among the ranks of other great publications with a mention in this category (MISC, SUCCESS Magazine, Time Out North America, and others). Congratulations again to our team! Happy Anniversary to the Kirby Center! Our client, Hillsdale College, is celebrating the five-year anniversary of its Washington, DC-based Allan P. Kirby, Jr. Center for Constitutional Studies and Citizenship. The mission at the Kirby Center is to educate students and elected officials about the Constitution and its underlying principles of liberty. To mark the occasion, iostudio created a film—we planned the video’s concept, directed and filmed new footage and interviews, and edited the final piece. We think it’s pretty great. iostudio received Design Team of the Year honors at the 2015 Folio: Eddie & Ozzie Awards annual luncheon, held Oct. 19 in New York City. 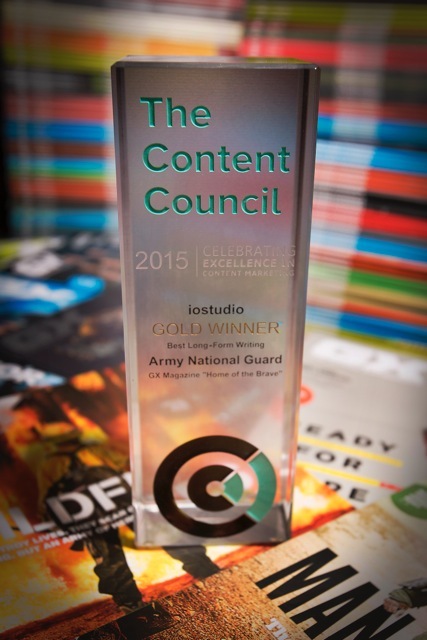 The prestigious award recognizes iostudio’s design staff for its work on GX: The Guard Experience magazine, an official publication of the U.S. Army National Guard that celebrates and supports Guard soldiers and families. The Folio: Eddie & Ozzie Awards competition, presented by Folio: Magazine, is the magazine industry’s largest competition that encompasses consumer, business-to-business and custom publications in digital and print, honoring editorial and design excellence for more than 20 years. The annual contest attracts entries from many of the nation’s top publications, including Time, National Geographic, People, Food & Wine, and Entertainment Weekly. This year’s competition drew more than 2,800 entries and was judged by a panel of more than 300 industry experts. In addition to the overall Design Team of the Year award, iostudio and GX received honorable mentions in six editorial and design categories: Editorial Team of the Year; Best Editorial, full issue, custom publication (6 or more issues); Best Series of Articles, custom publication; Best Overall Design, full issue, custom publication (6 or more issues); Best Cover, custom publication; and Best Feature Design, custom publication (6 or more issues). iostudio was the only finalist in both the overall Design Team of the Year and Editorial Team of the Year categories at this year’s show. This is also the third straight year that iostudio was a finalist in the category of best overall issue in both editorial and design categories.